You can never go wrong serving brownies at a party, especially these mouthwatering Irish Cream Brownies! Brownies are pretty much the perfect dessert for any party. Have you ever met someone who doesn’t like brownies? Even people who don’t normally choose chocolate go crazy for them. So I took that classic dessert and kicked it up a notch by slathering a thick layer of Irish Cream frosting on top. Meet your new go-to dessert: Irish Cream Brownies. As a general rule, brownies fall into a couple of different categories: cake-like or fudgy and frosted or unfrosted. As a rule, I always fall in the fudgy camp. (If I’m going to eat cake, I’ll just eat cake.) And I usually prefer my brownies straight up, but this frosting filled with Kerrygold Irish Cream Liqueur takes these chewy brownies up a notch. They are the perfect sweet treat to end any meal. 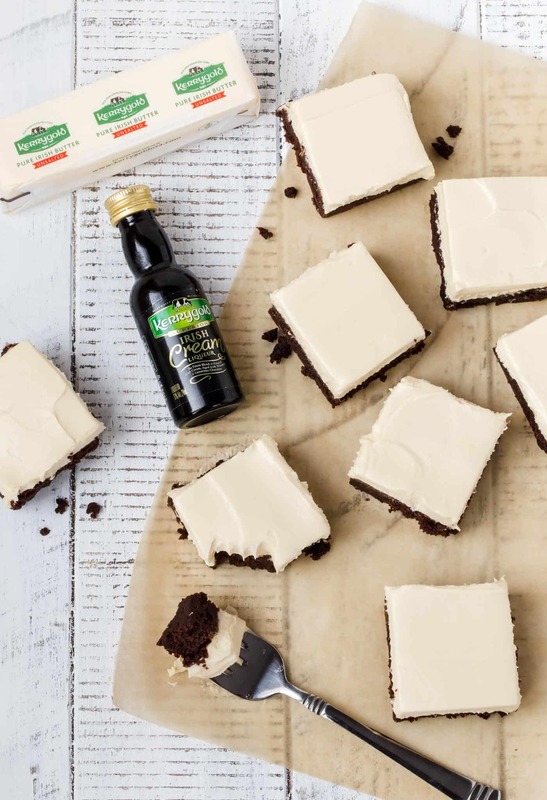 These Irish Cream Brownies give you a double dose of the Kerrygold products we love. The grass-fed butter makes these rich brownies dense and chewy. And the chocolate Irish Cream frosting adds just the right amount of decadence to every bite. I opted to not add the Irish Cream in the brownie batter for this recipe, but trust me it tastes amazing with it. So if you want a double dose of the Irish Cream, just add two tablespoons to the brownie batter and get that rich chocolaty Irish cream goodness in both layers. I think we nailed it with the frosting to brownie ratio, right? And for someone who generally prefers brownies on the plain, I’ve changed my tune and am now hooked on these Irish Cream Brownies. One bite and you will be, too. Hi I love this one but I live in Saudi Arabia so I cannot use to buy the liquor. But I can make it ? if I have a recipe. Can someone tell me how to make this liquor? 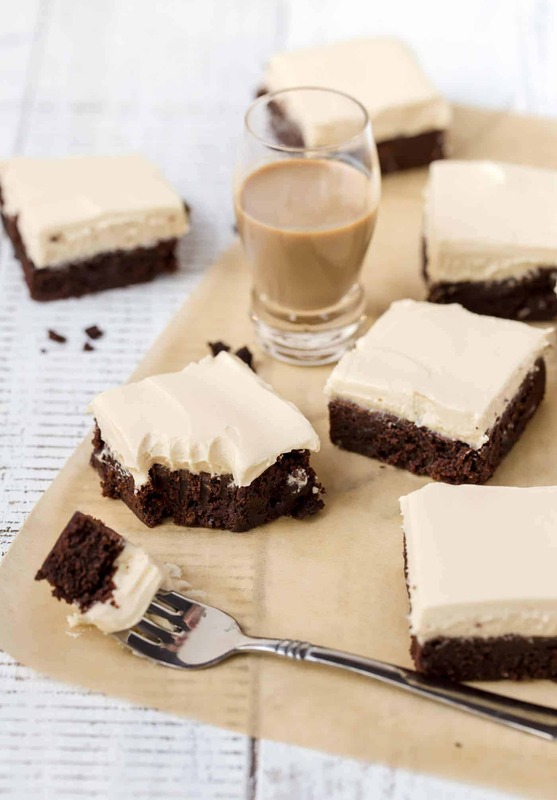 Irish cream is always a good idea and yes, you nailed the frosting to brownie ratio! These are calling my name! They couldn’t be more perfect! You have no idea how bad I’m craving these right now. These brownies look and sound absolutely amazing!!! You didn’t mention where the salted butter goes….in the cake or the icing?? Hi Audrey- Use the unsalted butter in the brownies and the salted butter in the frosting! Enjoy!